Three angles from which to view a researchers’ practice (A, B, C) and three kinds of formulation of each angle (1, 2, 3), which define the nine combinations (A1-C3) discussed in the last chapter of my book, Unruly Complexity: Ecology, Interpretation, Engagement (U. Chicago Press, 2005) and introduced in two previous posts. 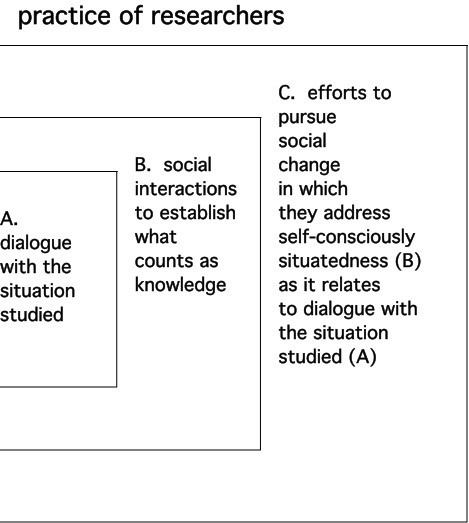 This entry was posted in environmental studies, reflective practice, Sci&TechStudies(STS) and tagged complexity, ecology, engagement, environmental studies, intersecting processes, practice, unruly complexity on March 11, 2011 by Peter J. Taylor. My book, Unruly Complexity: Ecology, Interpretation, Engagement (Taylor 2005), considers three angles—like facets of a crystal—from which to view the practice of researchers (as introduced in the previous post). This entry was posted in environmental studies, reflective practice, Sci&TechStudies(STS) and tagged complexity, ecology, environmental studies, H. T. Odum, heterogeneous_construction, intersecting_processes, practice, unruly complexity on March 8, 2011 by Peter J. Taylor. Attention to practice—to what scientists actually do—was a key development in the interpretation of science during the 1980s. This development is covered well by the collection of essays, Science as Practice and Culture (Pickering 1992a), and in the editor’s introduction (Pickering 1992b). Pickering adds the term culture to denote the “field of resources that practice operates in and on” (1992b, 2), and stresses the importance of considering the temporal aspect of practice—the process of making science as against the products. Latour (1994) also explores a process metaphysics for interpretation of science, which follows the philosopher Whitehead. Even though the reconstructions of the Kerang Farm study and the other case in Taylor (2005, Chapter 4) do not trace the course over time of the researchers’ work, they share the emphasis on process and scientific practice. Heterogeneous construction might be read as Pickering’s (1993) “mangle” and “impure dynamics,” and the imagination of scientists as his “modeling.” However, although Pickering shares many of the concepts outlined in the previous post on construction of science, he theorizes practice mostly in terms of experimental practice (with one foray into conceptual practice). In an effort to distance himself from previous work that focused on sociological explanations of scientific knowledge, he diminishes the role of wider social resources and avoids discussion of causes. For Pickering, it is mostly because scientists tinker with tangible objects, whose resistance requires accommodation, that their goals and interests are subject to ongoing revision. Studies of practice in this sense are reviewed by Golinski (1990). In contrast, mathematical models or representations produced by researchers form the entry points in Taylor (2005, Chapter 4); intepreting them motivates my analyses. 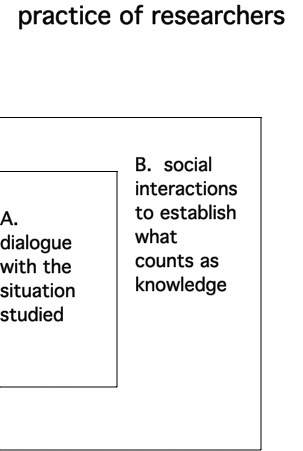 I also remain interested in causes and explanation that span different domains of social practice. Lynch (1993) presents a strong challenge to the aspiration of explaining science. From an ethnomethodological perspective, he argues that sociological analysts cannot secure a vantage point that enables them to remain outside the vernacular language and epistemic commitments of the communities studied. How particular results stand with respect to prior results, how a laboratory’s findings contribute to the disciplines, and so on are settled for all practical purposes by locally organized, embodied practices of handling equipment, making experiments work, presenting arguments in texts or demonstrations, and so on. When this is observed carefully—ethnomethodologically—it bears little relation to practitioners’ accounts of what happened and why. By implication, interpreters of science can do no better. My response to this challenge is to note that descriptions are not explanatorily innocent and ethnomethodological descriptions privilege explanations of the action of individual agents that assume extra-local or trans-local considerations have no effect on their mental calculating or imagining. It is not clear that this lack of effect—especially on unconscious mental processes and embodied physical responses—could be demonstrated ethnomethodologically. Interrogating individuals about their motivations and memories, and asking them to display them to audiences would not resolve the question because practitioners, as Lynch argues, are not privileged explainers of their own practice. Turner (1994) strongly criticizes the project of interpreting science in terms of practice, but his objection is not to interpreters looking at what scientists do, but to their explaining knowledge by invoking hidden, but shared premises or knowledge embodied in practices or routines. This objection does not seem pertinent to interpretations of knowledge-making that tease out multiple, practical considerations. Golinski, J. (1990). “The theory of practice and the practice of theory: Sociological approaches in the history of science.” Isis 81: 492-505. Latour (1994). “Les objets ont-ils une histoire? Recontre de Pasteur et de Whitehead dans un bain d’acide lactique,” in I. Stengers (Ed. ), L’effet Whitehead. Paris: Vrin, 197-217. Lynch, M. (1993). Scientific Practice and Ordinary Action: Ethnomethodology and Social Studies of Science. Cambridge: Cambridge University Press. Pickering, A. (Ed.) (1992a). Science as Practice and Culture. Chicago: University of Chicago Press. —— (1992b). “From science as knowledge to science as practice,” in A. Pickering (Ed. ), Science as Practice and Culture. Chicago: University of Chicago Press, 1-8. —— (1993). “The Mangle of Practice: Agency and Emergence in Sociology of Science.” American Journal of Sociology 99(3): 559-589. Turner, S. (1994). The Social Theory of Practices: Tradition, Tacit Knowledge, and Presuppositions. Chicago: University of Chiacgo Press. This entry was posted in Sci&TechStudies(STS) and tagged ethnomethodology, explanation, Latour, Lynch, Pickering, practice, Sci&TechStudies(STS), science on November 18, 2010 by Peter J. Taylor.